On then to Sandsend, where, once more, Jonathan and Vivian Winterschladen entertained us at Romany Cottage. This was a first visit for many, including Terry, and we were heartened to hear that the family has no intention of changing things. Whilst some may describe the cottage as ‘primitive,’ it remains virtually unaltered since Romany’s time. One feels that whilst modernisation could improve creature comforts, it would be at the expense of a total change of atmosphere; and the ghost of Raq, which is occasionally to be heard running down the stairs, might be forever lost! Our evening concluded with an extensive raffle, presided over by Terry, whose humour added greatly to the task. Sunday morning’s weather was much improved as we joined the congregation of Sleights Methodist Church, for Sunday worship. Afterwards, we were treated to refreshments, and met several of the congregation who had known Romany. Terry took a press call at the orchard-site of Romany’s vardo, and we met a local man who remembered the time when the caravan had also rested at Carr End Farm, directly opposite the church. This was previously unknown to us, and certainly Eunice makes no mention of it in the biography of her husband. 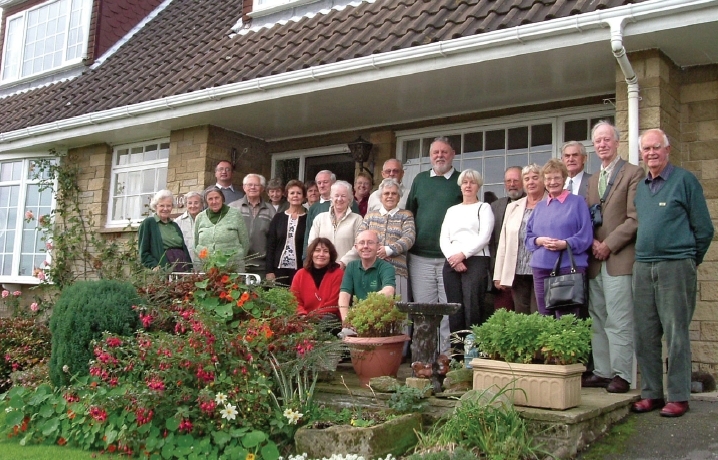 Finally, George and Mary invited the entire party back to ‘Dunfarmin,’ their lovely home in Sleights. With their dining-room table groaning under the weight of food, we all felt it our duty to relieve the pressure on the table legs; after all, we didn’t want it to collapse, did we? Terry, George and I gave a lengthy telephone interview to the Yorkshire Post (a subsequent report appearing there), and then it was time for a last ‘team photo’ on the porch, and the happy party broke up (until next year, of course!). We have great plans for a possible Cheshire-based reunion for 2006. This entry was posted in Uncategorized by RomSoc203Admin. Bookmark the permalink.